I know that Labor Day weekend is the unofficial start of fall, but we still have a few weeks until summer actually ends and I am holding on for dear life. 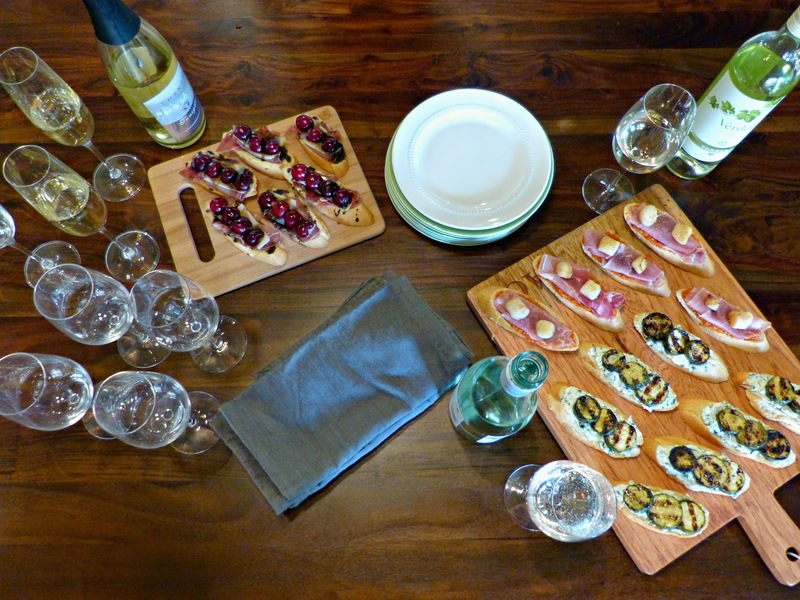 In the spirit of Indian summers, I hosted a little white wine tasting and crostini pairing at home recently. Crisp white wine is the perfect drink for a summer night when it's hot and humid and it stays light outside well into the evening. And for me, there's no better way to enjoy a glass of wine than by pairing it with some delicious and complementary food. Because it's summer I don't have the desire to stay inside all day crafting a multi-course dinner with wine pairings-- although talk to me during a Chicago winter and that might be right up my alley! 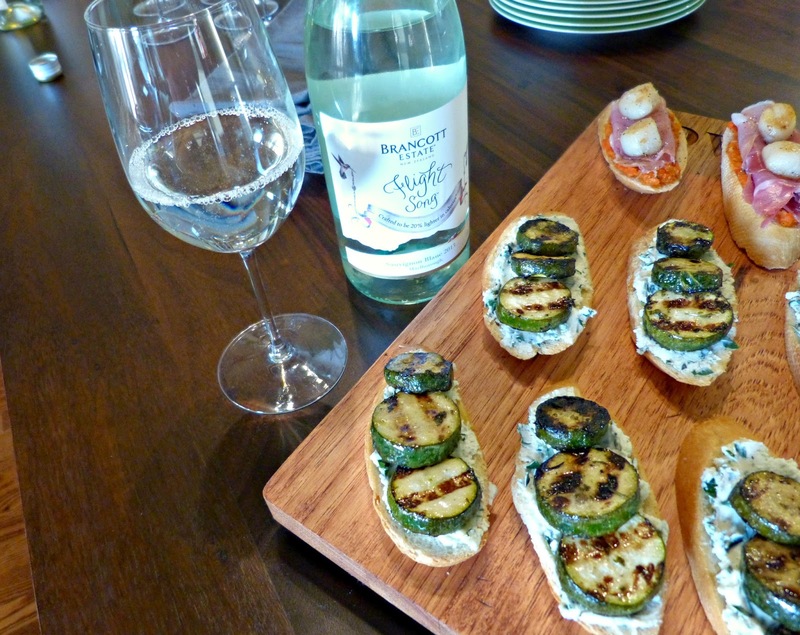 Instead, I thought it would be fun to create a special crostini to pair with each of the three wines we were tasting. 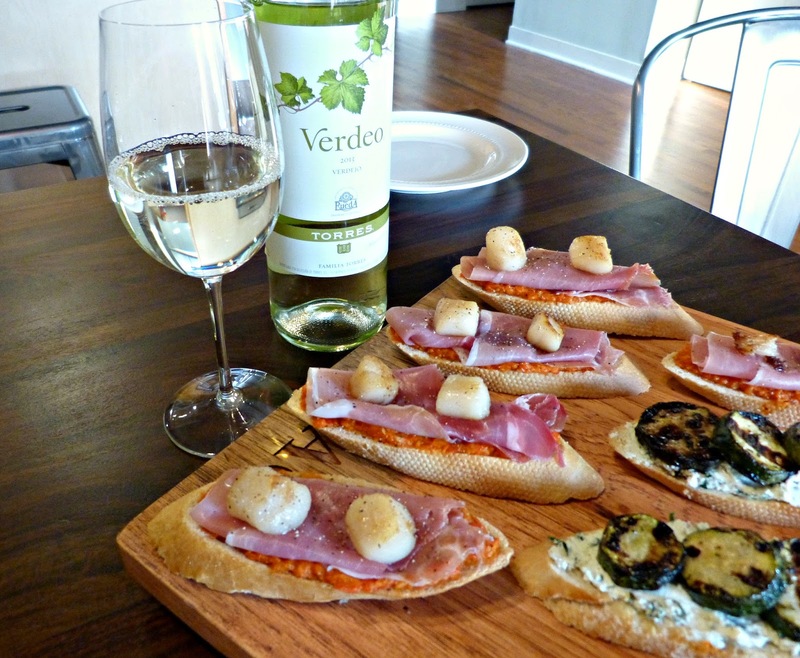 Each wine was different from the next, so the crostini needed to follow suit. Creating these pairings involved a little research on my end, but the results were a fun and delicious to enjoy three very different white wines. Brancott Estate Flight Song Sauvignon Blanc - A New Zealand Sauvignon Blanc with "fragrant, lemongrass aromas with almost pungent tomato leaf intensity." This wine is slightly sweet with notes of "pink graperfruit-like acidity" and because of when it is harvested, this wine is naturally lighter in sugar, alcohol and has 20% fewer calories than comparable wines. Torres Verdeo Verdejo - This crisp white wine is sometimes referred to as the Sauvignon Blanc of Spain. Verdejo is fresh, elegant, and is recognized "by distinct notes of tropical fruit accompanied by citrus and a touch of fennel." Chateau Chantal Tonight Sparkling Wine - From one of my favorite northern Michigan wineries, this dry Riesling-Chardonnay blend or "Blanc de Blanc" (a white wine made with white grapes) was the only sparkling wine that we sampled. The wine is a little bit fruity with hints of minerality and notes of pear and apple. 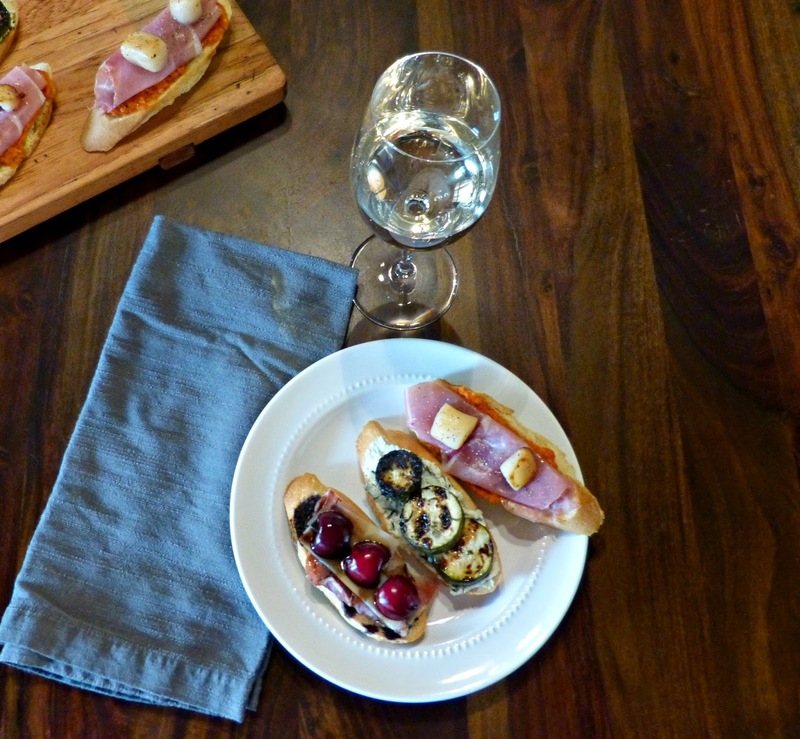 These three wines were paired with a variety of homemade crostini. 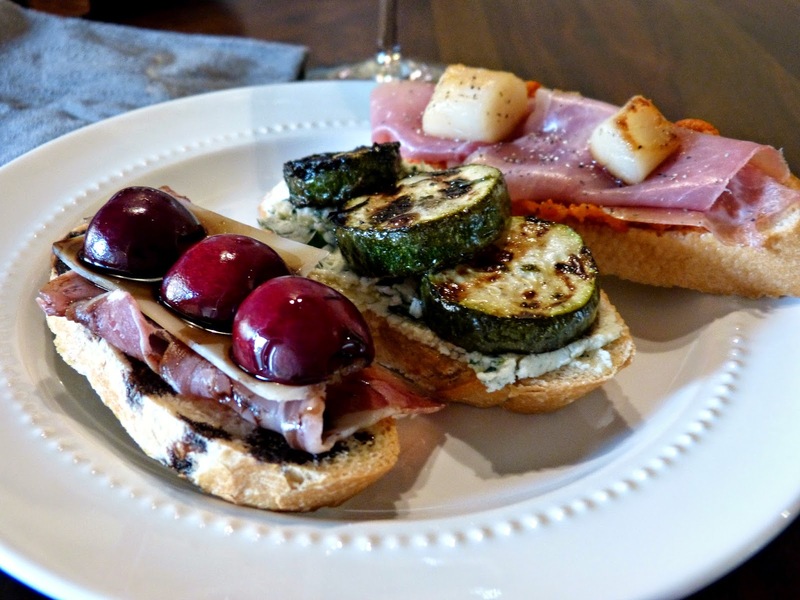 Though the toppings differed, the crostini began with the same base. I bought a long French baguette and sliced it on the diagonal into 1/2-inch slices. Arrange them on a baking sheets, drizzle each lightly with olive oil, season with salt and pepper, and bake for 12-15 minutes at 350 degrees. Remove from oven and cool at room temperature. 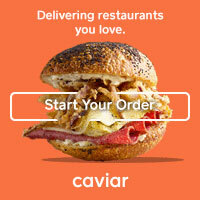 Finish with desired toppings. The most classic pairing for a slightly sweet and crisp Sauvignon Blanc is alongside a creamy goat cheese. The herbal notes in a Sauvignon Blanc are also complemented by fresh herbs, so the homemade herbed goat cheese on this crostini is a no brainer. Marinated and grilled zucchini makes it perfect for summer. In a medium or large zip sealing plastic bag, combine zucchini, olive oil, crushed garlic, dry parsley, salt, and pepper. Refrigerate for at least 4 hours or overnight, if possible. Preheat grill to medium heat. Oil grates and gently place slices on the grill. Grill until zucchini is softened and grill marks appear, a few minutes. Flip the slices and grill for another few minutes until grill marks are visible on both sides. Meanwhile, stir softened goat cheese and fresh herbs together until combined. Spread in a thick layer on top of each toast. Top with warm grilled zucchini slices (3 to a toast worked well for me, overlapping slightly) and serve. A fresh and fruity Spanish wine, Verdejo pairs well with bold exotic flavors and shellfish. With that in mind, I paired this Verdejo with seared scallops and traditional Spanish flavors like jamon serrano, roasted red pepper, and smoky Spanish paprika. In the bowl of a small chopper or a food processor, combine roasted peppers, garlic, 1 tsp. olive oil, salt, pepper, and paprika. Pulse until a smooth spread-like consistency is formed. Spread the mixture on top of each toast. Fold up a slice of jamon serrano so that it fits neatly on top of each pepper spread-topped toast. Heat remaining oil in a skillet over medium high heat. Season scallops with salt and pepper and sear for about 2 minutes, turn, and sear for another 2-3 minutes until golden brown. Add about 2 scallops to the top of each crostini. Sparkling wines are traditionally paired with something very much like them or totally the opposite: super sweet or very salty. 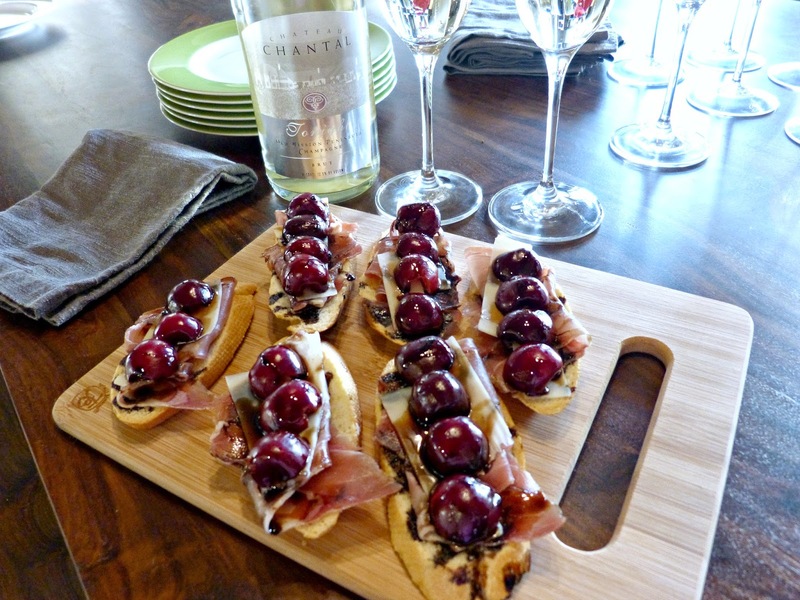 With that in mind, I decided to pair this brut sparking wine with salty parmesan and prosciutto, sweet and tangy balsamic reduction, and as a nod to its norther Michigan origin, fresh sweet cherries. Add balsamic vinegar to a small saucepan and bring to a boil. Reduce heat to medium and simmer until the vinegar is reduced and has a thick syrupy consistency (usually about 15-20 minutes). Remove from heat and allow to cool. On top of each toast, layer one folded slice of prosciutto, a few shavings of parmesan, and top with 3-4 cherry slices. Drizzle with cooled balsamic glaze and serve. Editor's Note: Verdeo Verdejo and Flight Song wines were provided to me at no cost to facilitate this post. The opinions expressed here-- as always-- are my own. Thank you for supporting the brands that make A Squared possible!